Eat Your City: Padmanadi Vegetarian Restaurant Edmonton AB - tasty vegan fare - yes, there's no meat, eggs or fish! 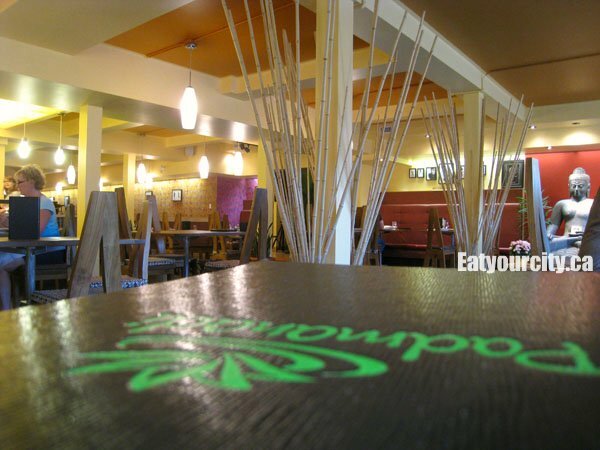 Padmanadi Vegetarian Restaurant Edmonton AB - tasty vegan fare - yes, there's no meat, eggs or fish! After hearing some food, er.. good things about this vegetarian place, and having spotted its fun colorful signage many times as I pass through the area, we gathered up some friends willing to have a meal sans meat... that's right, no chicken, beef, pork, fish, milk or eggs, as this restaurant specializes in not only vegetarian food.. they only cook a blend of Chinese/Indonesian/Thai/Indian vegan fare. Well, technically, you can have chicken, beef, pork, shrimp and fish.. they are all incorporated into dishes as tofu imitators... soy protein is created (and disguised) into chicken and beef slices, pieces of shrimp.. and even slices of black cod. Settling into some funky wooden chairs and benches, we peek at the menu in the midst of the brightly light restaurant with a wooden Buddha in the corner, lots of fresh greenery and light golden hued tables. As it was a hot and muggy night, we ordered the specials to cool off - blended iced lychee drink as well as their blended iced pineapple drink The iced pineapple drink while cool and refreshing, tasted like canned pineapple blended with ice and some sugar. For $5, we were hoping for fresh pineapple, as its summer, and despite Edmonton being a landlocked city, we do get fresh pineapple shipped in year around. The iced lychee drink was better, as it tasted like fresh lychee (its in season as of this post) blended with ice and sugar. Both drinks came in handy later on as we used it to cool burning mouths from some of their spicier dishes. One of our fellow foodies opted for a soy latte, which came a bit foam top-heavy, though she pronounced the flavors was quite good after she sipped off most of the foam. 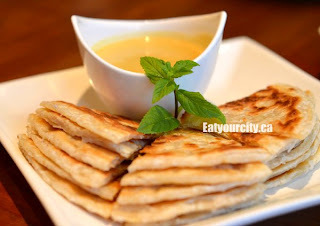 We started off with a small platter of roti - grilled Indonesian flatbread served with a curry dipping sauce. The roti was hot, flakey and crisp. Some of us enjoyed it as it was multi layered and crisp, while some of use preferred the Thai version which is a bit softer in the center. 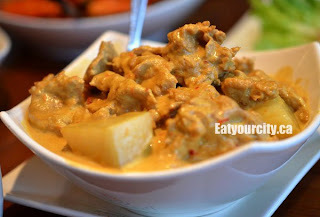 The dipping sauce was a very mild coconut milk based curry with hints of kaffir lime leaves. The dipping sauce turned out to be the same curry as the chicken curry we ordered later on. 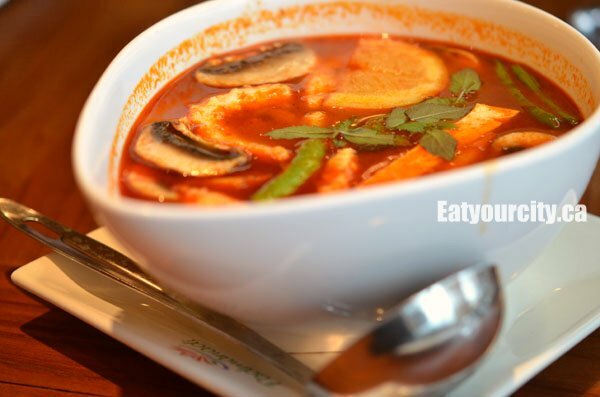 Advertised as a Thai spicy soup with vegetarian seafood, tofu, sliced mushrooms, snap peas and garnished with a slice of lemon, it certainly delivered on the spicy side of things. The soup was an alarming shade of red, flavoured with lemongrass, mint, sweet basil - it was savory, spicy and a touch too much on the sour side for traditional Tom Yum soup.. leaning towards a hot and sour soup. The vegan shrimp was springy and though it looked like a child's attempt with playdoh to shape it into a shrimp shape, it tasted like white shrimp. The iced drinks came into play as we used it to cool off our burning mouths. 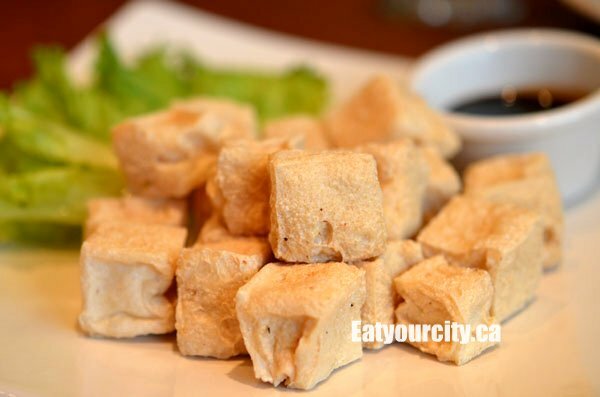 These pale fried tofu cubes came with a slightly thickened sweet soysauce based dipping sauce called kecap manis. The texture of the tofu was surprising - they tasted like fishballs! While the exterior was crisp, they had a bouncy mouthfeel similar to chinese fishballs. Eaten alone or with the dipping sauce, they were not your run of the mill deep fried tofu, and made for a nice appetizer to share. These thick Indonesian style yellow noodles sauteed with vegan chicken strips, yu choy, some julienned carrots and bean sprouts - reminded us strongly of Shanghai noodles. Cooked in a large gas fired wok, the noodles are aromatic, savory and tasty (if a bit on the greasy side)... and a favorite of the night. The vegan chicken strips were the most realistic "meat" of the night - appearing and tasting like strips of marinated chicken. Vegan fillets of black cod was tossed with sauteed baby corn, sliced carrots, sweet peas, tomato wedges, green peas - all smothered in a startling red sweet and sour sauce. The vegan cod fillets tasted like deep fried fish - complete with a black cod "skin" around the fillet piece. It had a slight smokey flavor so one of our foodies thought it tasted closer to ham than fish. 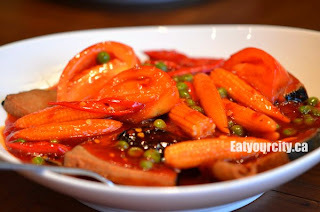 The sweet and sour sauce was similar to one you would find at any Westernized Asian restaurant, though it did have a small bit of heat lent to it from a few slivers of hot peppers. Recommended to us by our waiter as a customer favourite, the vegan chicken pieces while looking like randomly chopped pieces of chicken swimming in a mild coconut milk based curry with hints of kaffir lime leaves (or the curry roti sauce), did not resemble chicken in texture or taste. As tofu chicken, its good, as an imitation meat, this one missed the mark out of all the "meats" tonight. Still, the coconut rich curry with chunks of potato, carrots and cauliflower is great on fragrant coconut rice we ordered to go with it. Surprisingly stuffed, despite having a meal with no meat - but many tofu protein based "meats", we barely have room for dessert - and pack up a few leftover items for lunch. Padmanadi makes all the vegan desserts in house, so unfortunately, by the time dessert time rolls around, they are sold out of their creme brulee and carrot cake, both which we had our eyes on earlier. 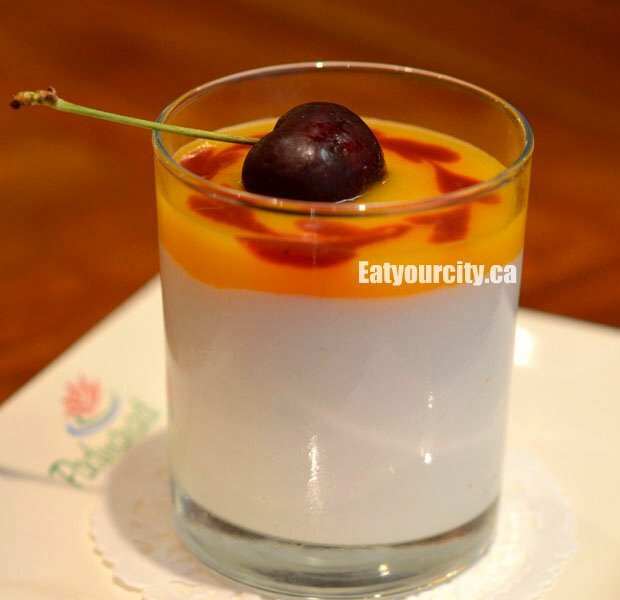 We go with the panna cotta to share, which was a good plan as it was a large glass full of coconut milk based gelatin, topped with a fruit puree and a fresh cherry on top. Though not your traditional panna cotta - no cream allowed, the large amount of coconut milk while giving it a punch of coconuttiness, made the gelatin a bit on the runny and grainy side. Still, dessert is always a nice way to finish off the evening. 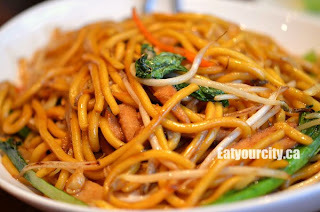 Overall, a good vegan restaurant with lots of selection, different flavors and a wide selection of vegan "meats". 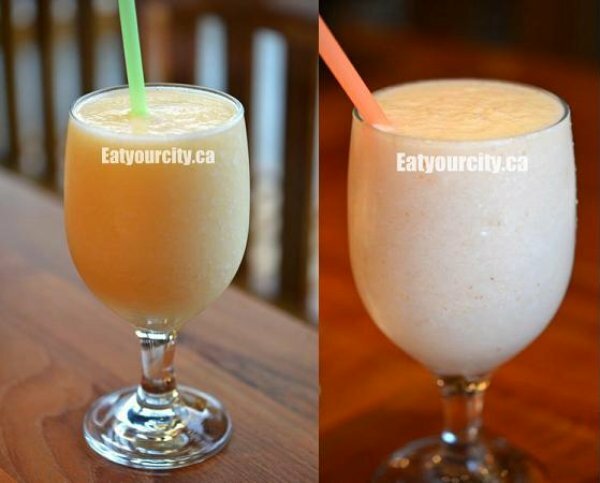 I would have liked to see more seasonal fresh fruit incorporated into their drinks and desserts, as many fruit elements tasted like they came from a can - and while Edmonton gets its two allotted weeks of summer, they should take advantage and showcase some of the fresh seasonal fruit available. 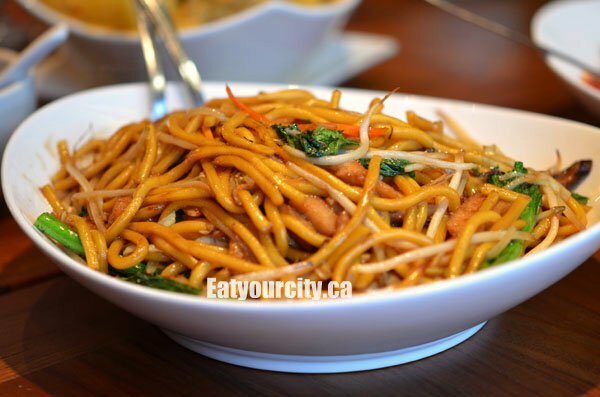 Go try it for something different, though stay away from some of the more greasy dishes if you're gearing to go here for healthier fare. There is a vegan brunch available on the weekends from 10am-2pm, and an occasional vegan buffet for folks that want to try a little of everything about once a month.